We are St Michael the Archangel parish, in Nanaimo, BC. Are you thinking of visiting us? 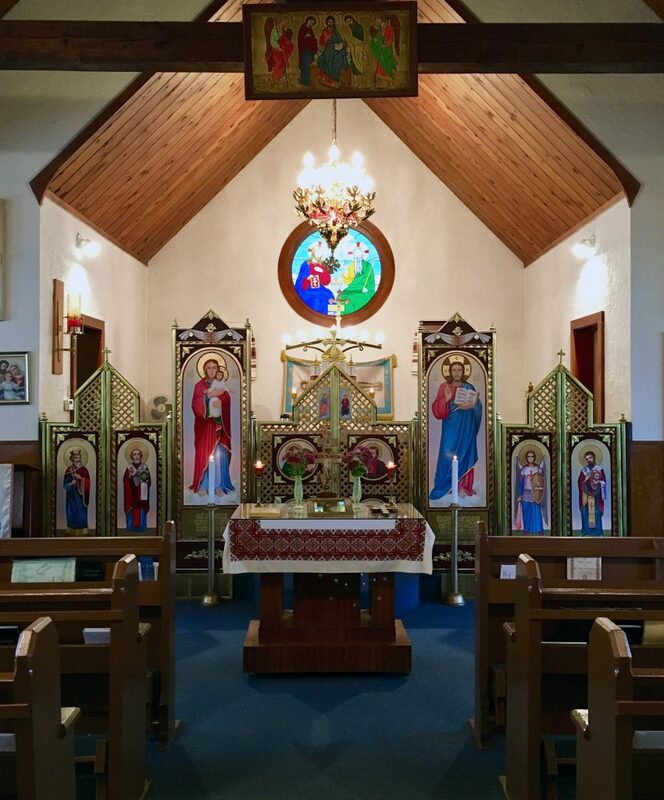 Whether you are a complete newcomer to the Byzantine Rite, a Ukrainian Catholic from out-of-town, or someone wanting to connect with your Ukrainian heritage, we want you to feel welcome. We hope the information here will help by giving you an idea of what to expect. Some of the information on this page is purely practical, but we've also tried to give some introductory information regarding the form of our liturgical worship. If you are a newcomer—perhaps a Roman Catholic interested in knowing more about the Eastern Catholic churches, a non-Catholic Christian interested in Eastern spiritual traditions, or someone of no religion who is curious about what we do and believe—it can be intimidating to walk into an unfamiliar space and to try to follow along with an unfamiliar church service. Our location page tells you how to get to our church from various parts of Nanaimo. If you have driven, park in the spaces in front of the church and adjacent hall, or on the street. If you need to use the washroom before the service starts, head into the parish hall. When you open the door you'll be facing the kitchen. The women's washrooms are to the left of the kitchen; the men's are off to the far right. When you enter through the front doors, note the table to your left. It will usually have a stack of this week's bulletin. You'll want to take one of these, because parts of today's service are printed in the bulletin. If you require wheelchair access, or otherwise have problem with the steps to the front door, there is a ramp on the left side of the church. Entering the main body of the church, you will see before you the ikonostasis, the screen of holy images behind which is the sanctuary and altar. The royal doors of the sanctuary are closed until the service starts. People who know our tradition often do a couple of special things when they come into the church. They will cross themselves and make a bow (metany) towards the altar. They may then go to the front of the church, where there is a table with icons and a cross on it. They will cross themselves and bow again—traditionally three times, twice before and once after each veneration—and then venerate (kiss) each icon, in turn, before going to their seat. You are welcome to do this if you wish, but nobody expects it of you, and nobody will mind or notice if you just go straight to a pew and sit down. Sit anywhere you like: there are no reserved pews, and nobody will mind where you sit. Now that you've arrived, you might wonder how long our service will be. It's usually about an hour from start to finish. Sometimes there are additional prayers before or after the service for special feast days, or panakhyda (memorial prayers) for deceased parishioners. These only extend the service by a short time. Children are very welcome at St Michael's! If you've brought a little one with you, you might want to ask about the bell ringing. The person who rings the big church bell during the service is happy to share that job with children. You'll find one of these small, black books in your pew. It contains most of the words you will hear during the service. We start on page 13. The book is bilingual: on the left side, you'll see Ukrainian, and on the right side, English. The service is conducted in a mixture of Ukrainian and English, with the Bible readings and homily in English. Once you get used to the structure of the service, it is easy to follow along in the bilingual book. The priest may begin the service in Ukrainian, so there may be a couple of sentences in Ukrainian right at the start; then we will switch to English for much of the rest of the service. If you are familiar with the Roman Catholic mass, or one of the Western worship traditions derived from it, some individual parts of the service will be familiar—the Nicene Creed, the Sursum Corda ('lift up your hearts'), the angelic hymn ('Holy, Holy, Holy'), and, of course, the Lord's Prayer (which we usually sing in both Ukrainian and English)—, but the overall structure of the service differs. The Eastern liturgies retain antiphons and many responsorial litanies that are no longer part of the Roman Rite. These litanies punctuate the action of the liturgy with prayers for peace, for the Church, for our nation and home, for our lives and, especially, for mercy. The response in these litanies is most often 'Lord, have mercy'—in Ukrainian, 'Господи, помилуй', pronounced hós-po-dy po-mý-luy—, and sometimes 'Grant this, O Lord'—in Ukrainian, 'Подай, Господи', pronounced po-dái hós-po-dy. Every once in a while the book tells you to refer to this week's bulletin for the proper prayers or readings of the day. If you are paying attention to the book and suddenly you are lost, have no fear! We are probably reading something from the bulletin, and we'll be back to the book very shortly. The priest prays some parts of the service quietly, or omits parts of the book that are used only on special occasions, which can be a little confusing at first. If you attend the service a few times, this will all seem easy. Note that during the Sunday Divine Liturgy (celebrated on Saturday at St Michael's), we do not kneel during the service. In our tradition, every Sunday is treated as a reflection of Easter, so we stand rather than kneel in acknowledgement that we are resurrected in Christ. During weekday services, we kneel where indicated in the liturgy book. Sung liturgy or spoken liturgy? Sometimes the liturgy is sung, and other times it is spoken. This mostly depends on whether we have people present who can lead the singing. If the strong singers are away on holiday, then most of the service will be spoken. No musical instruments are employed in the Byzantine Rite, so all singing is a cappella, using traditional melodies from the rich tradition of Eastern liturgical chant. In the pew, you will also find a binder of hymns. Hymns are not part of the liturgy, but may be sung at the beginning and end of the service, and during communion. The hymns for the day are listed in the bulletin, and they are usually sung in English or alternating English and Ukrainian verses. If you are a Catholic, of any particular church in communion with Rome, and fulfill the normal conditions for receipt of the holy sacrament of the Eucharist, you may receive communion at our church. Note that the way communion is administered in the Byzantine Rite differs from the tradition of the Roman Rite. The consecrated bread, which is cut from a leavened loaf (prosphoron), rather than an unleavened wafer, is submerged in the consecrated wine, and is administered using a spoon, directly into the communicant's mouth. There is no 'communion in the hand' in the Byzantine Rite. When it is time to receive communion, we walk up the central aisle of the church to where the priest stands at the front of the church. Traditionally, we approach communion with our arms crossed over our chests (again, this differs from the modern Roman practice, where that posture indicates one wishes to receive a blessing instead of communion). When it is your turn, step directly before the priest, tilt your head back, and open your mouth. If you're tall, you might bend your knees a bit, especially if the priest is short. The priest will use a spoon to tip the Eucharist into your mouth. Return to your pew via the side aisles. Saint Michael the Archangel, defend us in battle. Be our defence against the wickedness and snares of the devil. May God rebuke him, we humbly pray, and do you, O prince of the heavenly host, cast into Hell Satan and the other evil spirits that prowl the world seeking the ruin of souls. When the service is concluded, most people will again approach the icons and cross on the table at the front of the church, and venerate these. They may also take a piece of blessed bread that the priest has placed there. This bread is the antidoron, the outer parts of the prosphoron loaf that were not consecrated for communion. Everyone is invited to have a piece of the blessed bread at the end of the service. Even those who are unable to receive communion with us are welcome to share in the antidoron. Join us after the service in the church hall for coffee. Usually, there is also something to eat: maybe sandwiches one week, cake another week, or a selection of cold cuts and cheeses. Occasionally, a parishioner will make borscht for everybody, which is a particular treat. On special occasions, such as our patronal feast in November, we have a parish potluck after the service. Please do come and say hello. We are a friendly community, and would love to meet you, and answer any questions you may have. This is also an opportunity to speak with the priest. Sometimes there are more people, sometimes fewer. Sometimes there are quite a few families with children, sometimes not. If you want a good sense of what our church is like, come several times. Of course we hope you will keep coming, and become part of our parish family.